I have had a few friends lately ask me to look at a piece of furniture before they updated it. All of them thought that they had solid wood furniture and did not want to ruin it. As I looked at the pieces I have had to be the one to break the news to them that although it was beautiful, it was not made of solid wood boards. Most of the furniture I look at these days is partially solid wood, and partially wood veneer. Even brands of furniture that are associated with quality furniture probably have some pieces that are not solid wood. Veneered furniture has been around for a loooong time. A thin layer of pretty solid hardwood is glued to a piece of plywood or particle board. Because the surface is a hardwood solid, it can be sanded, stained, varnished and look amazing. You just must be careful not to sand off too much wood. Not knowing the true make up of a piece of furniture can cause you to ruin it when you decide to repurpose the piece. 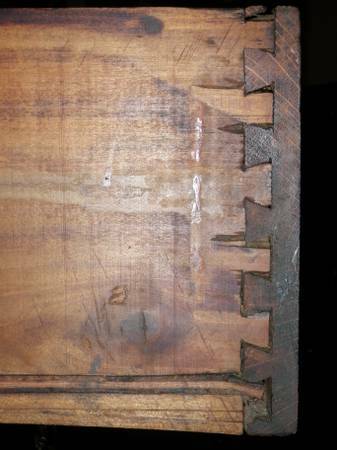 If it is veneer, you need to check to see that the veneer is on securely. If it has peeled off in places and you are going to paint it, no big deal. Sand it, fill the area with wood filler and then once it is dry sand again. if there is particle board involved, it has to be sealed anywhere that the particle board will come in contact with something wet. ( FYI- paint is a liquid.) I recommend a primer applied lightly in coats over these areas. Get a really thick primer like Zinzer bonding primer or Glidden Gripper. Both of those product state that they also seal. Look at it where it was not varnished or stained. Under the piece, the back inside the drawer space. You will get a better idea in those places. Pick it up. If a piece is unbelievably heavy for its’ size, it is 99% sure not to be solid wood. All that glue and pressed wood is heavier than a solid wood piece would normally be. Solid wood furniture is generally not super heavy for its size. Check the edges if there is a veneer ( thin skin of solid wood over something else) the place you can most easily tell is on a sharp edge. A piece not being solid wood never scared me off, but knowing what something is made of does affect how I re-do it. Even Ikea furniture can be painted, but it takes the right materials and you cannot sand through the plastic-ee coating or the particle board insides will puff when they get wet. Even antique furniture my not be solid wood. About 20 years ago we bought a church pew from an antique store. It was pretty oak wood but needed some work. We decided to have it stripped so that we could re-stain it. We found out the hard way that it was really plywood with an oak veneer on top. When we got it stripped professionally, the glue holding veneer on also dissolved and we have a few places on it even today that has a wrinkled look. Lesson learned. This really old, pretty serpentine dresser that is going to be my kitchen island is an example of veneered wood. 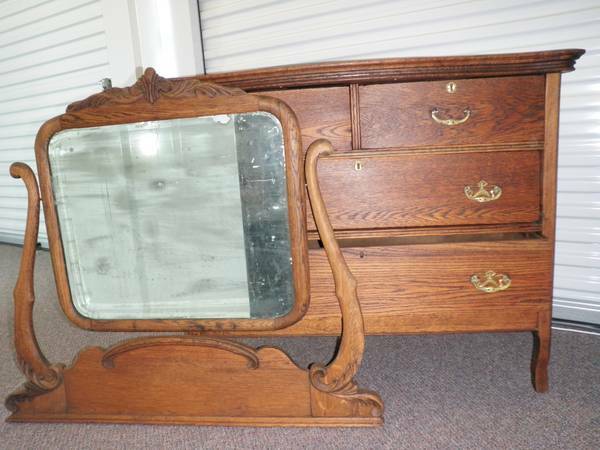 The mirror frame is solid wood. I am still thinking about what to do with that part. Any suggestions for me? The drawers are solid wood. The dresser cabinet is another story. The top is veneer in fact the reason I got this piece for a song is because the previous owner put screws in the top trying to keep the veneer down at the back of the piece. The side panels are veneer. Look at it. basically the way that veneer is created is that they shave a log in a circle so that they create a continuous piece of hardwood that is way wider than the actual log would have been. (Think unrolling a cinnamon roll.) That means that the grain looks funny when you actually study it. The legs are solid wood. If I were going to refinish this piece I would have to be careful with the side panels and would have to replace the veneer on the top. I am going to paint the body, leave the drawers stained wood, and put a butcher block top on it that follows the serpentine shape. 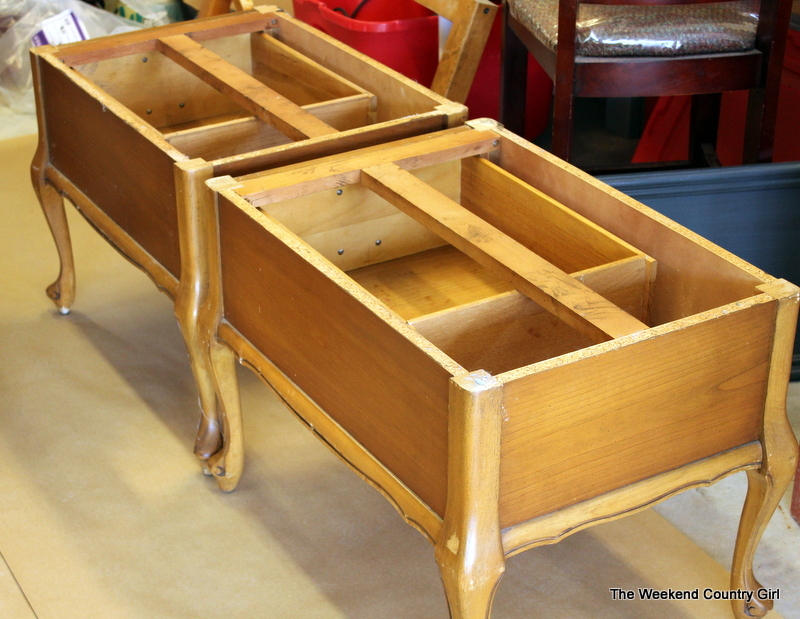 These French Provincial side tables are veneer over particle board. It was no big deal because they were going to be painted, but I did have to make sure that we kept the inside area dry. I only use Gripper primer on particle board furniture. Get the grey tinted variety if the color you are painting is dark. There are times when I have been pleasantly surprised too. This table ended up being solid wood. I was shocked. 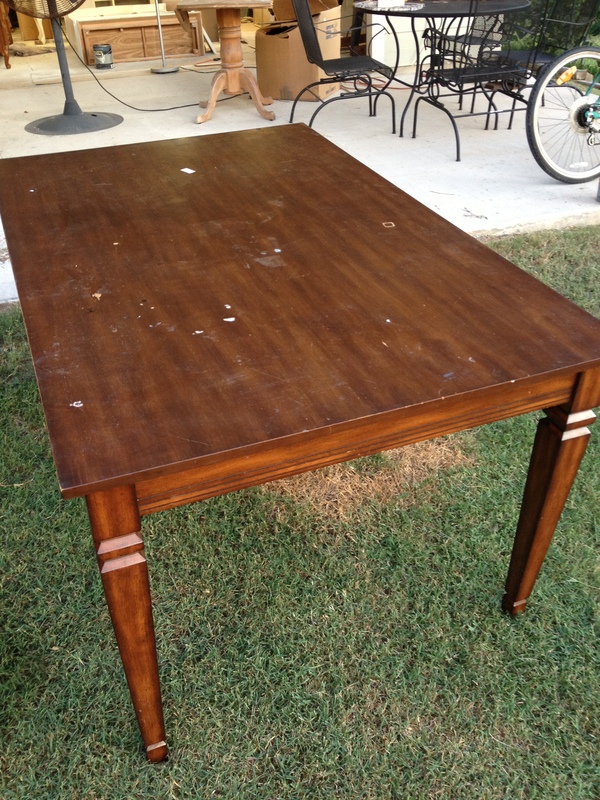 We bought it for $20.00 and it is getting cut in half, length-wise for a sofa table in my new family room. 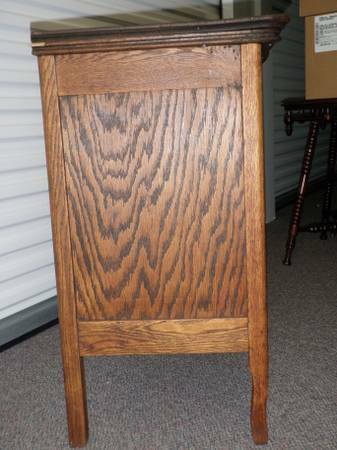 I did not know it was solid wood until it was flipped over to take home. I am sanding the top down and staining it now that I know! Can’t wait to see what you do!! Thank you. I think it is coming together in my head. I only hope it can look like what I see in my mind. Well even if it doesn’t, it will still make a great post!